Carrie represents top-tier global and U.S. clients in commercial litigation and class actions. Clients turn to Carrie for no-nonsense business advice and practical legal counsel that preserves and protects their business rights and successfully defends them in both commercial disputes and consumer-related litigation. She also has experience in matters involving fraud, deceptive trade practices, unfair competition and trade secrets. A frequent writer and speaker on a range of topics, Carrie is involved with an ongoing exploration of local zoning regulatory issues for the communications industry regarding cell towers. She also tracks and follows trends in the defense of consumer litigation claims in areas such as the Fair Credit Reporting Act (FCRA) and the Telephone Consumer Protection Act (TCPA). 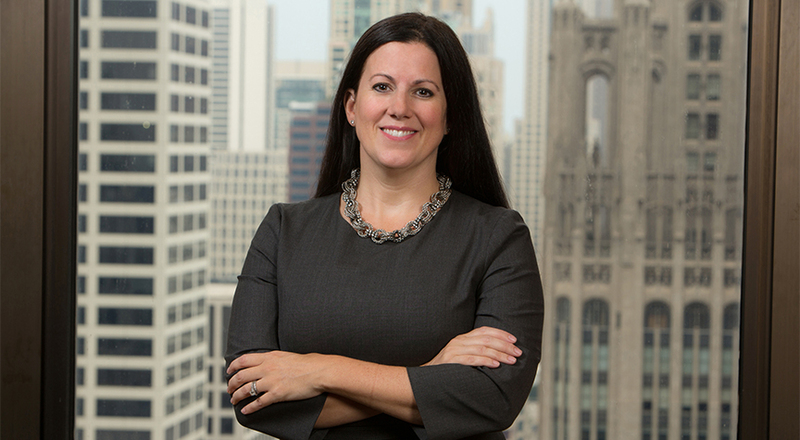 Carrie was recognized by Illinois Super Lawyers as a “Rising Star” from 2008-2010 and 2012-2014. She received her J.D., with honors, from DePaul University College of Law, where she was a member of the DePaul Law Review and Order of the Coif, and her B.A. from the University of Illinois at Urbana-Champaign. Obtained summary judgment in favor of client cooperative that had its nationwide financing program attacked as an alleged unenforceable, liquidated damage provision by a former member. Successfully obtained dismissal of a wage and hour class action brought against the largest taxi affiliations in the city of Chicago. The 7th Circuit affirmed the district court’s dismissal, setting a precedent under the Illinois Wage Payment and Collection Act. Orchestrated a defense strategy, including legislative efforts and preemptive actions, for several consumer class action lawsuits brought against a transportation client that resulted in a de minimis settlement for attorneys’ fees and legislative sanctioning of the challenged charges in the future. Obtained multiple temporary restraining orders and preliminary and permanent injunctions on behalf of one of the largest communications tower owners in the country. Handled all aspects of a tower company’s litigation and non-litigation needs in the Midwest region relating to maintenance of its property interests, including defending actions regarding leases, tax sales, foreclosures, eminent domain proceedings and negotiating with governmental authorities on taxation, ordinance enforcement and zoning issues. Successfully obtained a settlement after a favorable summary judgment ruling for a large consumer data compiler against one of its main competitors for defamation and tortious interference. Counterclaims were brought for false advertising and under the Lanham Act, which were also resolved favorably for the client. Managed day-to-day representation and coordination of multiple transportation companies’ first in the country litigation against a transportation network provider for unfair competition, including strategic efforts to get regulatory and legislative action and injunctive relief. Conducted day-to-day management of discovery for a high profile wrongful conviction matter that involved taking over 40 depositions, responding to four sets of extensive summary judgment briefing, a 7th Circuit interlocutory appeal on immunity issues and managing attendant insurance coverage issues that resulted in a significant settlement for the client. Coordinated response for consumer credit card data breach matter, including noticing of consumers and addressing attendant indemnification issues with credit card processors. Obtained the vacating of a multi-million dollar arbitration award that was sought to be confirmed against a consumer financial services company after prior counsel failed to object within the prescribed timeframe under the FAA. After a petition to vacate was filed and an evidentiary hearing was held, the award was set aside and attorneys’ fees were ultimately entered against opposing counsel. Successfully defended a large financial services company at lower court and appellate levels in numerous individual and class action cases for alleged TCPA and FCRA violations, as well in various state statutory debt collection actions. Represented a former CEO of a large publicly-traded company against allegations of fraud and violations of the Illinois Consumer Fraud and Deceptive Practices Act relating to financial restatements of the company’s 10-Ks and annual reports filed with the SEC. A very favorable settlement with the plaintiff was obtained, which included reimbursement of legal expenses after claims were brought against the company’s insurer for coverage. Arbitrated the claims of a large printing company against an international printing equipment supplier for misrepresentations and breach of contract relating to the installation of equipment. A favorable settlement was reached on the client’s behalf two weeks into the arbitration hearing. Successfully compelled arbitration and defended a major point-of-sale software developer in the arbitration against fraudulent inducement and breach of contract claims relating to an asset purchase agreement. The claimant’s request for reversion of software rights was denied and the claimant was granted a fraction of the damages claimed.